The security forces of Somalia's Federal Government have conducted a massive operation in the southern strategic city of Baidoa head of the presidential election slated for December 19. The house-to-house sweep came following separate grenade attacks in the town amid rivalry between the candidates vying for the Southwest State presidency. The election was delayed three times. 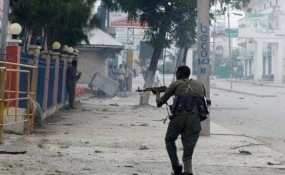 Several people were rounded up during the operation in connection with the latest bomb attacks in Baidoa, according to the local police, saying the city's overall security is no improving accordingly. The officials in Baidoa say the upcoming election will fair and credible despite allegations of interference from the Federal Government of Somalia which is allegedly backing some candidates. Former Al-Shabab deputy leader, Mukhtar Robow is among the aspirants in the race for the top seat.